Figure 1. 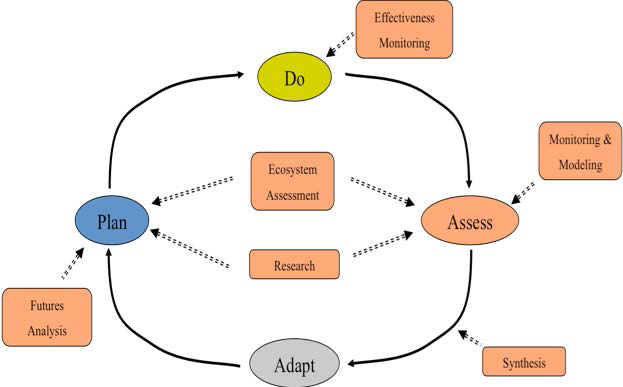 The adaptive management process used in the Action Agenda and Science Plan for the Puget Sound Partnership (page 4). This 2009-2011 Puget Sound Biennial Science Work Plan details the high-priority science activities required to: support the implementation of the Action Agenda; build capacity to revise and improve future Action Agendas; and enhance the Puget Sound Partnership’s ability to lead the ecosystem protection and restoration effort. This Work Plan is intended to be nested within the overall context of a Puget Sound Strategic Science Program. The Puget Sound Partnership’s Science Panel, with input and assistance from Partnership staff, prepared this Work Plan and is drafting a Strategic Science Plan to describe the underlying principles, structure and function of the Puget Sound science program. This Work Plan has by design a relatively short shelf life, being formally revised every second year. This initial plan covers the period from January 2009 through the end of June 2011; it includes the last six months of the 2007-09 state biennium and the entire 2009-11 state biennium. The Work Plan is the Science Panel’s blueprint for near-term science actions to support ecosystem recovery, but the Science Panel may deviate from the Work Plan if the best available science and analysis suggest other actions during this biennial cycle. Because this is the initial Work Plan, it focuses not only on identifying gaps and opportunities, but also on building and sustaining the technical procedures, capacity, and tools required for the Partnership. The Science Panel anticipates subsequent Work Plans will center on prioritized research, observations, and analysis required to advance Puget Sound protection and restoration. Lead the enhanced analysis, integration, and interpretation of available information using the most advanced and rigorous tools, resulting in the best possible current understanding of the Puget Sound ecosystem (Section 2.1). Support targeted studies, especially those that add valuable information to ongoing restoration and assessment projects, to improve the understanding of the ecosystem and the effectiveness of actions (Section 2.2). Build the technical and institutional capacity to generate, analyze, and communicate information required to adaptively manage Puget Sound (Section 3.1). Establish the organizational structure and procedures necessary for an efficient, transparent, adaptable, and sustainable science-based Puget Sound restoration and protection program (Section 3.2). The Partnership’s Action Agenda includes a number of science tasks or tasks with sciencerelated elements. The Science Panel is committed to working with Partnership staff and leaders to ensure that these science-related issues, and any others that need to be addressed to advance Biennial Science Work Plan 2009-2011 3 Puget Sound Partnership Science Panel protection, restoration, and pollution prevention, are aligned with and contribute to an integrated scientific program for the Puget Sound ecosystem. The Partnership’s Action Agenda outlines a number of important near-term actions for restoration, protection, and pollution control. With its focus on scientific investigations and science capacity-building for the next biennium, this Work Plan emphasizes areas of uncertainty and efforts to collect information to address uncertainties. The Science Panel appreciates the importance of acting now, in the face of uncertainty, and contends that scientific uncertainty is not a good reason to delay action, because there will always be uncertainty.